Cervical cancer, being the second highest cancer among females in Sri Lanka cutting across all income levels, will be a key focus area by the Ministry of Health and Rotary in the next 10 years. Through a comprehensive prevention and control program, we hope to achieve the shared vision for the women of Sri Lanka to be free of morbidity and mortality associated with cervical cancer by 2030 said the Ministry of Health Secretary Wasantha Perera at the historic MOU signing in ceremony at the Ministry of Health premises. The Sri Lankan economy is dependent on women with almost 70% of the economy employing women in the plantations sector, apparel and worker remittance whilst over 60% of teachers are females, which is why the Rotary decided to partner the Government of Sri Lanka with Rotary Sri Lanka and Maldives Governor Dushan Soza. 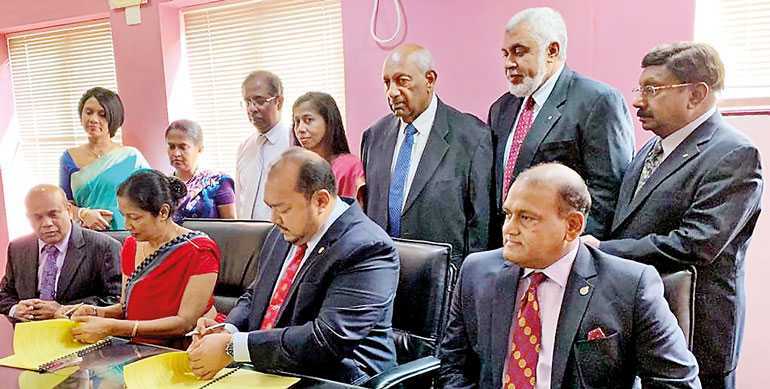 “Today, there are over 7.5 million females at risk for developing cervical cancer,” voiced Soza at the ceremony where Rotary Club of Colombo President Kumudu Warnakulasooriya signed on behalf of the Rotary. “Rotary Sri Lanka has a 95 year-old history of close involvement with the health sector, and has undertaken several initiatives to support and facilitate the country’s healthcare needs towards a healthier and disease-free nation,” commented the Rotary International Past President K. Ravindran, who was instrumental in starting this project. “Some of the key initiatives that the Rotary has partnered the Ministry of Health in Sri Lanka are; the Polio Plus campaign (which is part of a global initiative), setting up of Association for Prevention of Tuberculosis (CNAPT) to fight tuberculosis, setting up the cancer society to support the fight against cancer, setting up of Sri Lanka Anti-Narcotics Association (SLANA), the Mahamodera Maternity Hospital, Human Heart Valve Tissue Bank at LRH, and the present and longest running project of Rotary Sri Lanka, the Cancer Prevention and Early Detection Project,” said Ravindran, who was the first Sri Lankan to have had the privilege to head the global office of Rotary out of Evanston in the United States, giving leadership to 1.2 million Rotarians around the world. “We have a long-term commitment to support and facilitate efforts to achieve a significant decrease in the incidence of cancer in Sri Lanka, which is the second highest of the non-communicable diseases and claims several thousand lives each year,” commented President Warnakulasuriya. “This area of cancer prevention is not new to us in Rotary who have undertaken several key initiatives in partnership with National Cancer Control Programme to reduce the incidence of cancer, particularly breast cancer, through a widespread prevention, screening, early detection, and awareness program. We are now interested in actively supporting the current government initiatives in the fight against cervical cancer, which accounts for almost 10% of all cancers and has the second highest incidence of cancers in females,” said the dynamic Rotary Governor Soza who is spearheading many other key projects like the dengue eradicating project with CMC/ Ministry of Health in partnership with the WHO. “Rotary is the leading service organisation globally that has a nonvoting permanent seat in the United Nations General Assembly and in Sri Lanka, it is in the cutting edge for ‘doing good’,” said the Rotary Sri Lanka and Maldives Chairman of PR Dr. Rohantha Athukorala. “This is another one of those landmark initiatives in Sri Lanka by Rotary,” he said.